When Dean Romualdas Kasuba helped design the current home of the College of Engineering and Engineering Technology at NIU, the plans for the building (which opened in 1995) did not incorporate putting his name over the door of the building’s main auditorium. 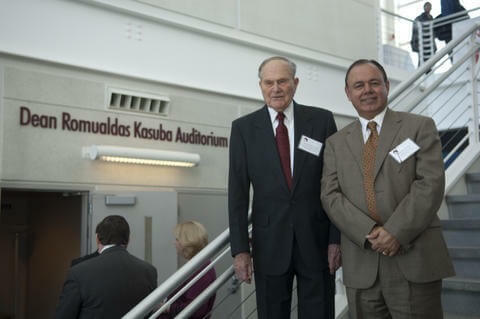 Dean Emeritus Romualdas Kasuba and current CEET Dean Promod Vohra at Tuesday's ceremony naming an auditorium in Kasuba's honor. That detail was taken care of Tuesday, Feb. 8, as the current leadership of the university and college honored Kasuba for guiding CEET through its earliest days and bringing it to national recognition. 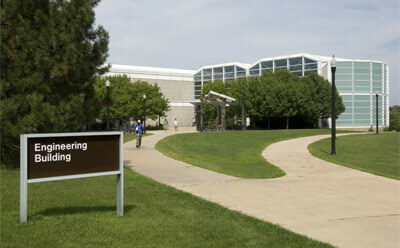 The auditorium naming was part of a series of events this year honoring the 25th anniversary of CEET’s founding. During the event, NIU leaders thanked Kasuba for his generous support of the college and his work as a goodwill ambassador for CEET since his retirement in 2003. Kasuba arrived at NIU in June of 1986, just a few months after the college had been officially established on paper. The college had some aspects of an engineering school, but was far from a full-fledged institution. Working almost non-stop, he quickly assembled a faculty and staff, and within four years the school had attained full accreditation – an accomplishment that some say never happened before or since. “The college was launched into initial orbit in record time,” Kasuba said, slyly referencing his professional experiences in aerospace engineering, which included work on the Saturn rocket program, development of the Lunar Excursion Module and unmanned flight projects. That accomplishment resonated with NIU Executive Vice President and Provost Raymond Alden, who arrived in DeKalb many years later, but was impressed nonetheless. The rapid pace of development continued throughout Kasuba’s 17-years at the helm of the college. He credited that success to NIU’s commitment to teamwork, excellence and high achievement, which creates an environment where students can achieve their goals. Since his retirement, Kasuba has continued to conduct research on international engineering education, collaborating with colleagues in Lithuania and at NIU. He also is currently a member of the promotion and post tenure committee at Kaunas University of Technology, the leading technical university in northern Europe, and has ongoing relationships with other universities in the United States, Europe and Japan. Kasuba also served on a parliamentary commission at the Parliament of the Republic of Lithuania, from 2006 until 2009. While his travels take him far and wide, Kasuba said that NIU is never far from his thoughts. “I always felt that I belonged here at NIU, and the College of Engineering and Engineering Technology is my home,” Kasuba said. In appreciation for naming the auditorium in his honor, the Kasubas, who live in St. Charles, have created two endowed scholarships to support students in the college studying mechanical engineering.